This year's three-man race for MVP is as good as it gets, while other awards competitions (Most Improved, Rookie of the Year) leave something to be desired. Here are our first-quarter picks. Now that all 30 NBA teams have passed the 20-game mark in the regular season, it's time to hand out some first-quarter awards. These award selections are intended solely as a reflection of games played through Sunday, rather than as a projection of the final year-end results. The heated race for Most Valuable Player is the headliner this year, but there's plenty of intriguing races to examine around the league. Check out our picks below. The Sam Presti Talent Diaspora has created one hell of a three-headed MVP race between Westbrook, Harden and Durant. This race is as good as it gets: all three former Thunder teammates are: playing central roles for winning teams, enjoying career years, surpassing expectations, telling compelling stories, and registering historic statistical outputs. The Crossover's pick is Westbrook (31.1 PPG, 11 APG, 10.9 RPG), whose early work has been showered with praise thanks to a whopping 12 triple doubles in his first 24 games. 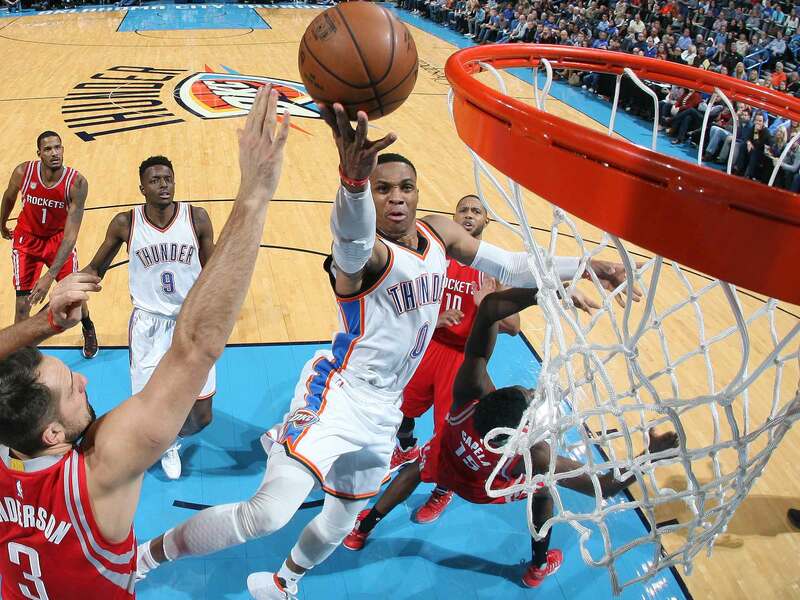 From a pure stat-accumulation standpoint, Westbrook is up to something seriously special. The following chart shows the largest combined totals of points, rebounds and assists for All-NBA First Team selections during the three-point era. The top performers are clear-cut Hall of Famers at their absolute most productive: Michael Jordan, Moses Malone, Shaquille O’Neal, LeBron James and Larry Bird. As it stands right now, Westbrook dwarfs all of them. What’s more, Westbrook has maintained a very healthy level of efficiency and an extraordinarily positive impact on his team’s performance while shouldering the single biggest burden of the three-point era (41.2 Usage rate). For all the (justified) critics questioning his shot selection, shooting numbers and inconsistent defense, Westbrook nevertheless ranks in the top five in both Player Efficiency and Real Plus-Minus. The following chart compares those same All-NBA First Teamers plotted by efficiency and usage. 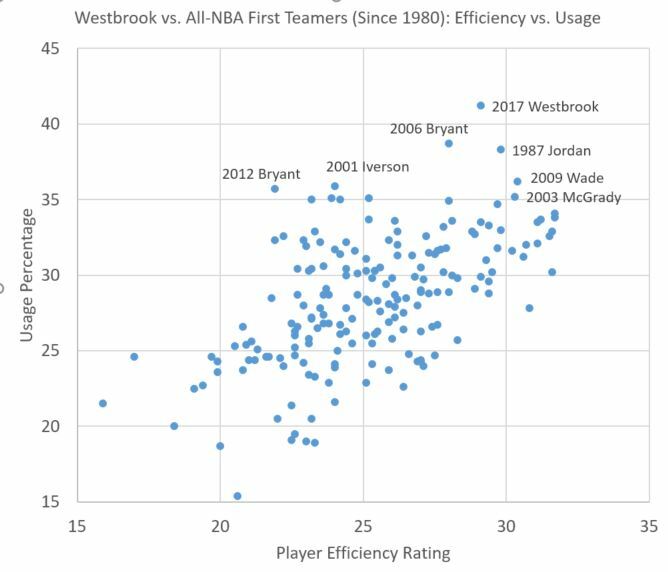 Here, Westbrook stands alone as an obvious outlier: his role is larger than any other star since 1980 while his efficiency compares favorably with other ultra-high-usage players like Jordan and Bryant in their respective primes. Some critics might argue that Westbrook is “doing too much” and that the Thunder would be better served with a more balanced approach. In fact, the impact numbers suggest a much different conclusion: Oklahoma City is utterly hopeless whenever Westbrook leaves the court. 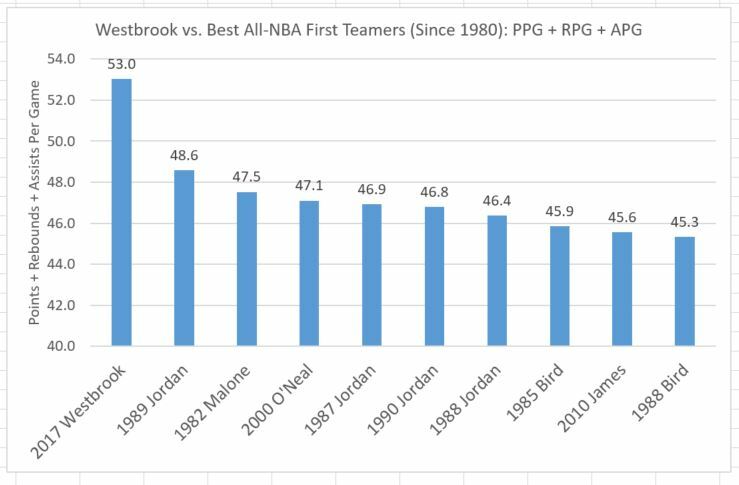 The following table compares Westbrook, Harden and Durant with the last five MVP winners. The first column shows each team’s net rating when the star is off the court. The second column shows each team’s net rating when the star is on the court. The final column shows the “swing.” For example, if a team is minus-10 without its star and plus-10 with him, the swing would be plus-20. What jumps out here, of course, is just how pitiful the Thunder are when Westbrook leaves the court. That shouldn’t really be a surprise given the personnel changes: Durant left unexpectedly this summer, Serge Ibaka was traded, rookie Domantas Sabonis has been forced to step in as a starter, and back-up guard Cameron Payne has been out injured. As a result, the Westbrook-less Thunder have been far worse than the Rockets without Harden, wayyyyyy worse than the Warriors without Durant (no surprise), and worse than any of the last five teams with an MVP. With Westbrook, the Thunder have been good, but not quite great. The resulting swing when he takes the court, though, is gigantic, comparing favorably to Curry’s impact during his first 2015 MVP season and significantly greater than Harden or Durant this season. Westbrook as the be-all, end-all isn’t a championship formula, but it has been enough to keep the Thunder (15-9) firmly in the West’s playoff picture and near the top of the list when it comes to the league’s most watchable teams. Everything that Westbrook’s diehard fans and anti-Durant activists were hoping for—an 82-game kamikaze mission with zero bleeps given along the way—has come to fruition. His passion and energy have always been unrivaled, but now they’re focused, through the general public’s lens, squarely at a bullseye with Durant’s image. That’s a narrative with nearly as much emotional appeal as “Stephen Curry propels a one-man three-point revolution.” The MVP is Westbrook’s to lose. The player best positioned to overtake Westbrook is Harden (27.8 PPG, 7.6 RPG, 11.6 APG), whose Rockets (17-7) have meshed seamlessly under new coach Mike D’Antoni and boast the NBA’s fourth-ranked offense. Like Westbrook, Harden’s stats are out of the world (his PPG/RPG/APG haven’t been matched by any player since Oscar Robertson in 1966), his role is gigantic (33.5 usage), and both his impact and efficiency are elite (top five in RPM and PER). More importantly, last year’s locker room drama that led to Kevin McHale’s firing and a disappointing first-round exit has not yet resurfaced. Instead, Harden has taken both his offensive creativity and his accountability as a franchise player to new heights. While it’s correct to say that Westbrook has had “less help” than Harden, that could very well mean that Houston’s success proves more sustainable over an 82-game season, provided Harden remains in good health. Indeed, the Rockets have beaten multiple quality opponents, including the Warriors, Spurs and Thunder, and have supporting pieces that fit more cleanly around their centerpiece playmaker. In the event that this comes down to late-season tiebreakers, Harden will be able to point to his recommitment to his physique, his improved focus on defense, and a better team culture in the wake of Dwight Howard’s departure. His supporters will also be able to argue that he’s due after finishing second to Curry in 2015, an argument that might prove especially convincing if this race comes down to Harden vs. Durant. Meanwhile, Durant (26 PPG, 8.4 PPG, 4.6 APG) is building a very strong case in fairly quiet fashion: He’s been the best player on the best team, he’s acclimated to the Warriors’ system with no real hiccups, his shooting numbers are obscene per usual, and he’s playing the most productive and effective defense of his career. His “maximizing every minute and shot” approach should receive more attention as the Warriors (21-4) push towards another eye-popping win total and make a run at the NBA’s all-time record for offensive efficiency. To overcome Superteam-centric counterarguments and surpass Westbrook and Harden in this race, Durant will need to deliver a signature reminder of his powers and the Warriors will need to open up a significant gap over the competition in the West standings. Given that Curry has hit 13 threes in a game this season and Klay Thompson scored 60 points in less than three quarters, there’s good reason to believe that Durant can shine brightly enough to focus the discussion back on how he, a bona fide MVP, is enjoying the best all-around season of his career. James (25 PPG, 7.7 RPG, 9.1 APG) and Paul (17.8 PPG, 5.2 RPG, 9.4 APG) fill out the top five. Both perennial MVP candidates are back again thanks to their strong individual numbers, their teams’ success and their central roles in driving two of the league’s best attacks. In such a crowded race at the top, both James and Paul suffer slightly from being surrounded by talented, experienced and familiar supporting casts. While the Cavaliers and Clippers would both be far different teams without James and Paul, the dependence factor just isn’t quite the same as it is in Oklahoma City and Houston. Durant, James and Paul make for a more apples-to-apples comparison, thanks to Durant’s strong supporting cast, but Golden State’s newest weapon possesses some clear tiebreakers. He has better PER and RPM marks than James by noticeable margins and the Warriors ran Paul’s Clippers off the court in their only head-to-head matchup. Honorable mention to Memphis’s Marc Gasol and San Antonio’s Kawhi Leonard. Voting on this year’s MVP race is like going to Baskin-Robbins and trying to pick the most delicious flavor. Voting on Rookie of the Year is like trudging to the Dollar Store and taste-testing budget toothpaste. 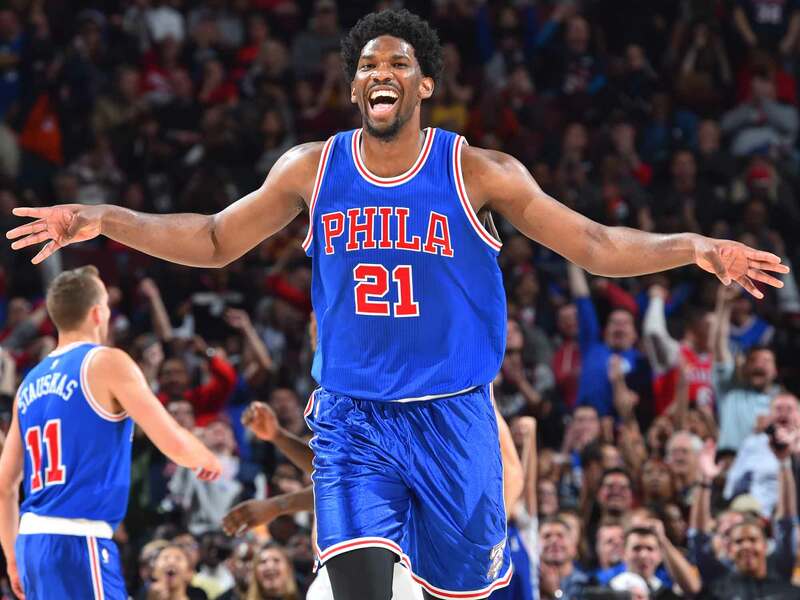 After missing two full seasons due to injury, Embiid has been a very pleasant surprise, a fantastic comeback story and an easy pick for this award. Unfortunately, Embiid’s overwhelming lead over the field says more about the field than it does about him. Consider: He’s only appeared in four wins, he’s missed nine of his team’s 24 games, and he’s yet to log 28+ minutes in a contest due to a minutes restriction. Yes, his per-36 stats (28P/12R/4B), three-point proficiency (44.2%) and major defensive impact (the Sixers’ defensive rating improves from 108 to 97.9 when he’s on the court) are all incredibly enticing, but his success has come entirely in fits and starts. In last year’s Rookie of the Year race, for example, Embiid’s limited availability would have left him clearly behind both Karl-Anthony Towns and Kristaps Porzingis into a race for third with Nikola Jokic. While 60% of Embiid happens to be better than 100% of anybody else, “The Process” will remain more valuable in theory than in practice until he scales up his minutes and scales down his absences. With 2016 No. 1 pick Ben Simmons sidelined and No. 2 Brandon Ingram struggling badly with his shooting numbers out of the gate, Embiid’s top competition has been Denver’s Jamal Murray (9.6 PPG, 2.8 RPG, 2 APG). Since failing to hit a shot in his first four games (0-of-16), the 19-year-old Canadian has mixed in some ups (four 20-point games) with the downs. Through 24 games, Murray has posted a better offensive and defensive ratings than Emmanuel Mudiay, the Nuggets’ 2015 lottery pick and starting point guard, and he’s played a big role on the league’s second-highest scoring bench. Although he’s had his fair share of turnover problems and no-show nights, Murray is leading his draft class in scoring and making the case for an even larger role on a somewhat respectable Nuggets squad. He’s coming by his numbers honestly and has easily outplayed older lottery guards like Buddy Hield and Kris Dunn. The third spot on the ballot comes down to Sabonis (6.5 PPG, 3.1 RPG) and Toronto’s Pascal Siakam (5.9 PPG, 3.7 RPG), two power forwards who have filled starting roles on winning teams right out of the gate. While Siakam, an unheralded No. 27 pick out of New Mexico State, has been the bigger surprise, Sabonis gets the nod here because he’s had a slightly larger role, in terms of minutes and shots, because he’s more skilled with the ball, and because his ability to stretch to the three-point line has created some much-needed spacing for the Thunder’s cramped offense. One tell-tale sign of an elite playmaker is that he can carry an offense regardless of who surrounds him. The same logic holds true for elite defenders like Gobert, who has led the Jazz to a top-five defense despite a long list of injuries to key players and multiple new arrivals in the rotation. George Hill and Gordon Hayward disappear for stretches? No problem. Boris Diaw starts to slow? No problem. Derrick Favors and Alec Burks go MIA for a month? No problem. The 24-year-old Gobert (11.8 PPG, 11.6 RPG, 2.9 BPG) has had the Jazz covered, leading his team in minutes and rebounds. Despite the rotating cast around him, the French center ranks fourth in Defensive Real Plus Minus and leads the league in blocks. His fearlessness protecting the rim and his activity around the protected circle have been major drivers in keeping the Jazz (15-10) afloat. 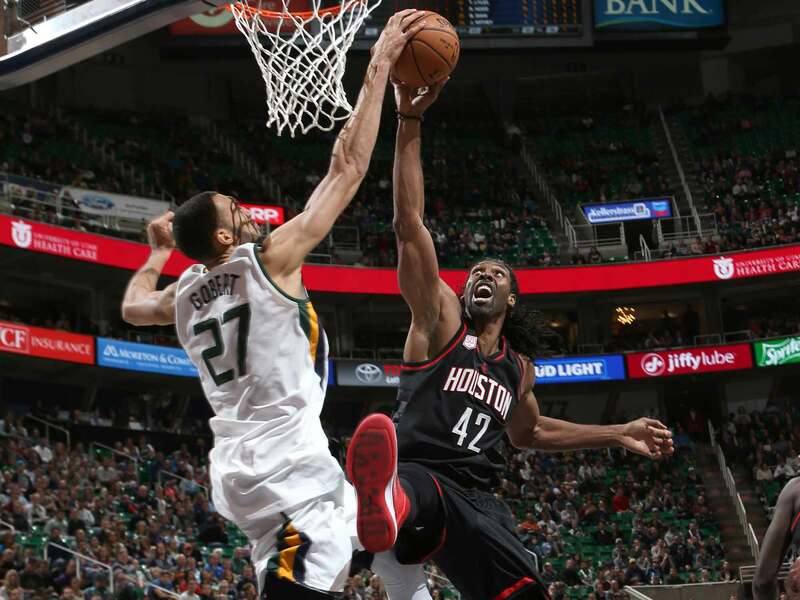 Last year, Utah was lost without Gobert, when he was sidelined with a knee injury. This year, they’ve been buoyed by him. Green and Jordan should both remain in this race to the end, as will Leonard, whose Spurs are still adjusting to life without Tim Duncan (and life with Pau Gasol) on the defensive end. Green and Jordan both rank in the top 10 in Defensive Real Plus Minus while playing lead roles on top-performing defensive units. After finishing second to Leonard in each of the last two years, Green (11 PPG, 8.3 RPG, 2.3 SPG, 1.3 BPG) has been especially vocal about his candidacy this year, questioning critics who bemoaned the losses of Andrew Bogut and Festus Ezeli before delivering on his own hype in a recent high-profile matchup with Blake Griffin. If Golden State’s team defense approaches the levels it reached during the last two seasons, voters will find it extremely hard to deny Green given his previous close calls, his fantastic energy, and his unmatched versatility. Jordan (11.3 PPG, 12.7 RPG, 1.6 BPG), meanwhile, has been a rock for the Clippers, whose team defense has been at or near the top of the charts through the first six weeks of the season. The shot-blocking, shot-altering center may suffer from split ballots, as teammates Chris Paul and Luc Mbah a Moute both grade out very well defensively by the major advanced metrics. This race is already over. Done. Antetokounmpo (21.9 PPG, 9 RPG, 5.9 APG, 2 SPG, 2.1 BPG), who finished third for this award last year, is the clearest Most Improved Player pick in recent memory. At 22, Milwaukee’s do-it-all franchise player has posted career-highs in (deep breath) points, rebounds, assists, steals, block, field goal percentage, Player Efficiency Rating and Usage Rate. What’s more, he’s long-stride Euro-stepped firmly into the “Top 20 players” conversation, ranking No. 9 in RPM and No. 10 in PER while leading the Bucks, in LeBron-like fashion, in all five major statistical categories. His individual talent is translating directly to team success: Milwaukee has been hanging around .500 with slightly above-average offensive and defensive efficiency rankings that both plummet when he leaves the court. Antetokounmpo’s profile should get a boost in New Orleans come February, as he’s the leader in the clubhouse when it comes to most deserving first-time All-Stars. 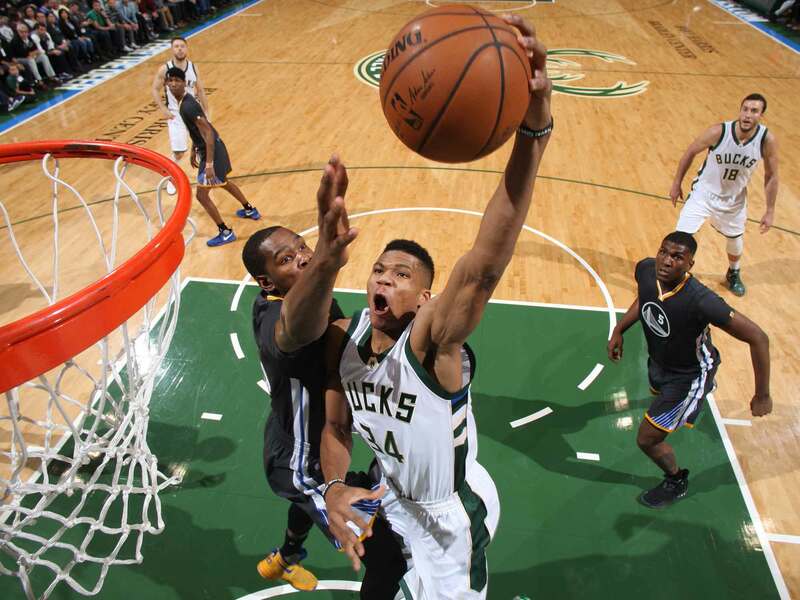 Want to get really excited about Antetokounmpo’s breakout? The best comp for his numbers is Larry Bird’s age-24 season in 1981. While most of the preseason hype around the 2015 draft class belonged to Karl-Anthony Towns, and deservedly so, Porzingis (20 PPG, 7.7 RPG, 1.9 BPG) has made big strides in closing the gap between the two young stars. The transfer of power from Carmelo Anthony to Porzingis is officially underway, as the 7'3" Latvian prodigy has improved his overall offensive efficiency, solidified his three-point range, settled into life as a rim-protector and played a leading role in the Knicks’ surprising start (14-10). Because Porzingis was hyped so thoroughly as a rookie, it’s possible that some observers might accidentally overlook him when it comes to this award. That would be a mistake, as he’s a stronger, smarter, more reliable and more confident all-around player in year two. In fact, Porzingis will deserve serious All-Star bubble talk if he maintains his current numbers through December. During a miserable season in Washington, Porter (13.9 PPG, 7.4 RPG, 2 SPG) has emerged as a rare bright spot, posting career highs in points, rebounds, steals and PER. The 2013 No. 3 pick has finally found his groove in year four, stroking the three-point ball and serving as a complementary scorer on offense while consistently serving as a plus wing defender. The bad news is two-fold: 1) Porter still doesn’t have a star’s ceiling and 2) Washington will need to pay handsomely to retain him next summer. Previous versions of Williams have been polarizing for analysts looking to dig past his gaudy PPG numbers, but this current iteration is simply awesome. 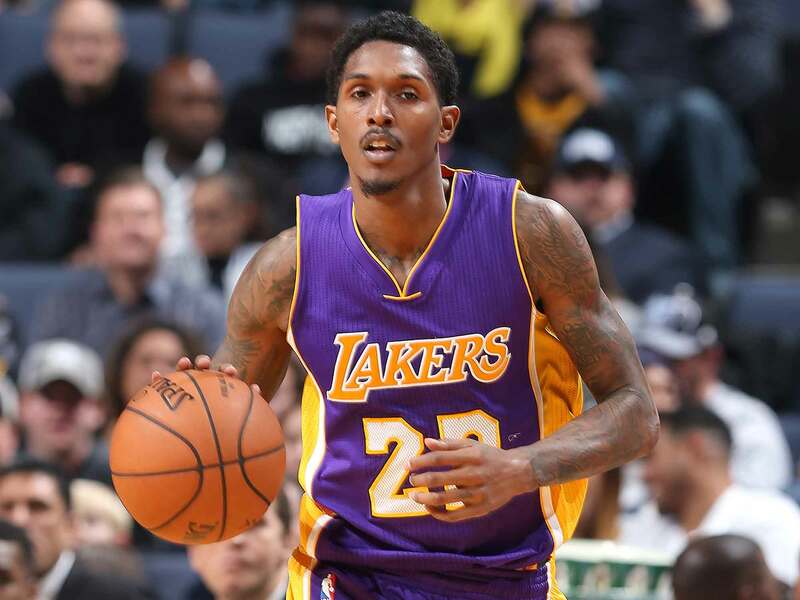 There might be no bigger early beneficiary of new coach Luke Walton’s arrival in LA than Williams (19.5 PPG, 3.4 APG, 25.1 PER), who has made full use of more minutes, more shots and a looser leash to open the season. The leading scorer on the NBA’s most productive bench, Williams has been red hot to open the season, shooting a career-best 40% on threes and boosting LA’s offensive efficiency by a whopping 13 points when he takes the court. Gordon (17 PPG, 2.8 RPG, 2.6 APG) has settled in nicely to greener pastures in Houston, escaping New Orleans after four-plus injury-plagued seasons and sliding in to a designated shooter role on coach Mike D’Antoni’s bench. Given his history of knee problems, his combo-guard size and his less-than-imposing defense, Gordon was due for a shift to a third guard role on a winning team that needed pop from a super-sub. Sure enough, his 43.1% shooting on 8+ three-point attempts per game has been a welcome addition. For the Rockets, who took a risk by signing him to a four-year deal, Gordon’s quick adjustment has been crucial in giving Harden the room he needs to dance against defenders. Chandler (18 PPG, 7.6 RPG) is a forgotten man on a forgotten team. Playing starters minutes in a reserve role, the 29-year-old forward is averaging career-highs in points, rebounds and PER after missing all of last season due to injury. The Nuggets rank second in bench scoring thanks in large part to Chandler’s offensive output, but his role is subject to change if Denver’s front office shakes things up at the deadline. Entering the season, my colleague Rob Mahoney documented Fizdale’s pitch to his new team: He was a “sniffin’ dog” that would lead them through adversity, much like a German Shephard might lead a Navy SEALs team through a war zone. So far, there’s no doubt about it: Fizdale has displayed unreal nostril strength. Even though we're less than halfway into December, Memphis has been through a lot: Zach Randolph was moved to the bench, major free-agent signing Chandler Parsons looks like damaged goods and star point guard Mike Conley is on the shelf. 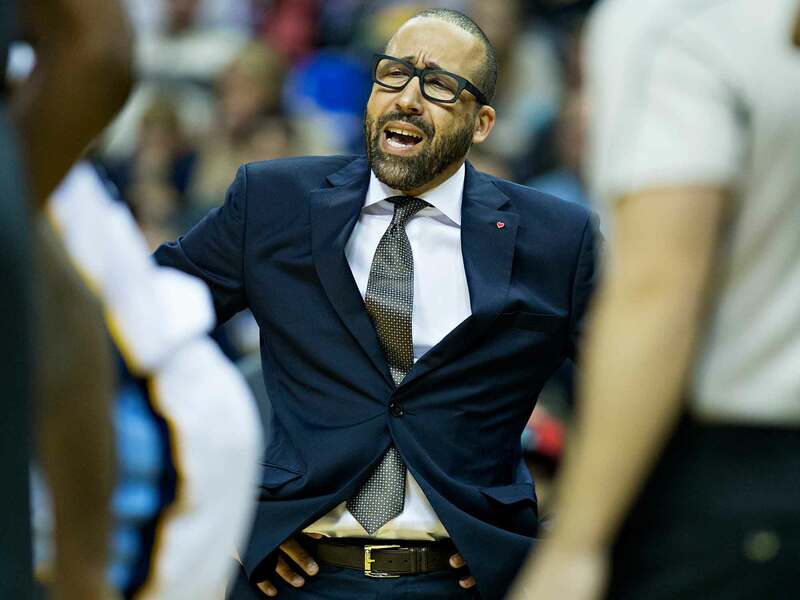 Despite being a first-time head coach, Fizdale has found the right course corrections, keeping the Grizzlies (17-8) well above water, overseeing the league’s stingiest defense, and helping them compile an astonishing 12-0 record in games that are within three points either way in the last minute. That late-game fortune is bound to even out eventually and the Grizzlies will almost certainly backslide as the impact of the injuries catch up. Still, Fizdale has hit the ground running in remarkable fashion, claiming this award easily, even before Memphis shocked Golden State by 21 points on Saturday. Like Harden in the MVP race, D’Antoni might ultimately prove to have better staying power than Fizdale. D’Antoni’s spread, three-heavy offense has buried good and bad teams alike by fully tapping into Harden’s abilities as a dual-threat scorer and passer. This isn’t just about keeping Harden happy: Patrick Beverley, Gordon, Ryan Anderson, Clint Capela and Sam Dekker are all finding success under their new coach. While D’Antoni might be benefiting from submarined expectations after Houston’s uneven 2015-16 season, his arrival has helped erase those memories overnight. A below-average defense will cause problems come playoff time, but the Rockets have enough firepower, directed smartly, to keep their coach in the awards conversation barring major injuries. Casey’s “story” isn’t as compelling as his results. The Raptors are right back where they were last season: Chasing Cleveland as the “best of the rest” in the East. Toronto’s steadiness has been admirable, but it shouldn’t be taken for granted given the team’s insane offensive efficiency and the number of inexperienced players being asked to fill frontcourt minutes. Casey’s ability to connect with his stars, construct an elite offense around two ball-dominant guards, and maintain a fairly respectable defense despite some glaring roster holes should keep him in the Coach of the Year mix.